This is the third and final post in a three-part series about the informal loan negotiation practices between ambulant vendors and a group known as "Bombay 5-6 lenders" in Tacloban City, Philippines. Dula and Grego describe the effects of these lending practices on the household and business activities of vendors who live and work on the edge of a precarious existence. Businesses are put up to generate income. For some micro-scale entrepreneurs like the ambulant vendors, there is a starker purpose in engaging in their trade. For those who live a hand-to-mouth existence, their business is their bread and butter - maybe more. The results of our study indicated that most respondents borrow money for either educational or medical expenditures for the family. Moreover, the frequency of their loans are significantly related to poor health conditions of family members and lack of savings. 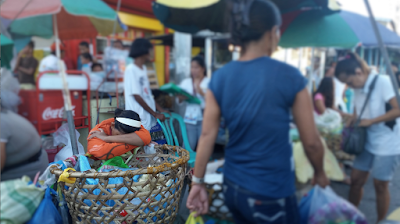 Since household subsistence has higher precedence over repayment of loans, vendors rely heavily on daily income to sustain daily household needs and are always a day away from potential default. Once an ambulant vendor experiences default, there is a high possibility that a series of such defaults will be experienced. Because lack of income is the primary cause of default, defaults have a domino effect as daily income goes toward loan repayments in a circular course. 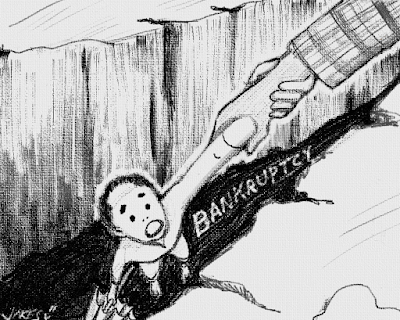 To have a debt is hard. To be caught in a cycle of debt is even harder. To be bound in a cyclical debt for a long period of time is beyond comparison. A person would normally feel ashamed if anyone knows that they are mired in debt. At the onset of this research study, we struggled to find prospective respondents because no one would ever admit to having a loan with a Bombay 5-6 lender. Realizing this, we re-phrased our question asking instead; “Do you know anyone among your fellow ambulant vendors who have existing loans from a Bombay 5-6 lender?” Amused by our question, one vendor referred us to another, who then referred us to another, until we found ourselves back with the first three (3) ambulant vendors we spoke with (who initially denied having such a loan). If only we knew then what those colorful beach umbrellas stood for. Most of the respondents have children who are still attending school. Most are in secondary school and at college level. Education for them is very important, as is their health. Most of our respondents have lost some perception of the magnitude of the economic situation in which they are entrenched. 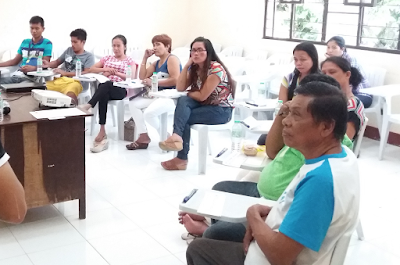 But one remarkable thing we discerned from our respondents is their sense of responsibility to provide their children with a chance for a brighter future - one quite different from parents’ own current situation. Earning at a subsistence level from their businesses is challenging for heads of family who work to maintain the robust health of family members or confront financial challenges when one person in the household requires medical attention. During our focus group discussions and in-depth interviews, one of our central questions was “Why Bombay 5-6?” We received a plethora of answers, of course, and as extensive as those documented in previous studies. In substantiating how accessible the Bombay 5-6 lenders are, one of our participants explained rhetorically: “If you have a sick family member and you don’t have money for their medication, would you approach formal financiers for a loan whence you’ll have to wait a month for the proceeds?” The answer would be the same when we asked why they go for a loan. It’s a matter of urgency, even survival. 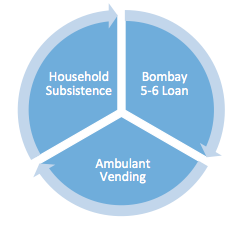 We have heard many justifications from ambulant vendors about why they have messed up with Bombay 5-6 lenders. With this study, we were able to gain insight - from a financial perspective - on how these marginalized traders are operating their businesses. Though not exhaustive or comprehensive, our study provides an important overview of the economic system encompassing vendors and lenders. Referring to the segmented cycle illustrated above, money borrowing can commence at any point (household, Bombay 5-6, or business). This is due to the absence of savings that could serve as a buffer between the three entities involved. Since the scale is at a daily subsistence level, an active and ongoing spin is understandable. In the long run, what was once considered disruptive becomes normal. This is one reason why most of our respondents showed no remorse over having a loan. Domingo Omoy, Sr. who has been an ambulant vendor for more than three (3) decades, said he cannot recall anymore a night where he had trouble sleeping because of a loan with a Bombay 5-6 lender. He reaffirmed that so long as the intention of taking on debt is for the welfare of his family, he will always find peace within himself and the determination to settle it. He admitted, though, that he does get a bit anxious whenever he fails to keep up with the repayment. Today, Domingo has two children who have finished college and who now work as elementary school teachers. And yet, he still borrows money from Bombay 5-6 lenders. Three more kids to support, he said, but soon the two of them will be done with their college studies. When asked if he would be over with his Bombay 5-6 affair by that time, he replies that he certainly does not know for sure. But one thing he is sure of, he said, is that he will make it through. The level of courage and endurance that Domingo and the rest of our respondents show is amazing. They have withstood the battle, but seem to have forgotten the urge to retire from their cyclic money borrowing activities. Some may already have achieved fleeting financial freedom on their own terms, but remain unaware that they are kept in a trap by deeply ingrained habits of making do.